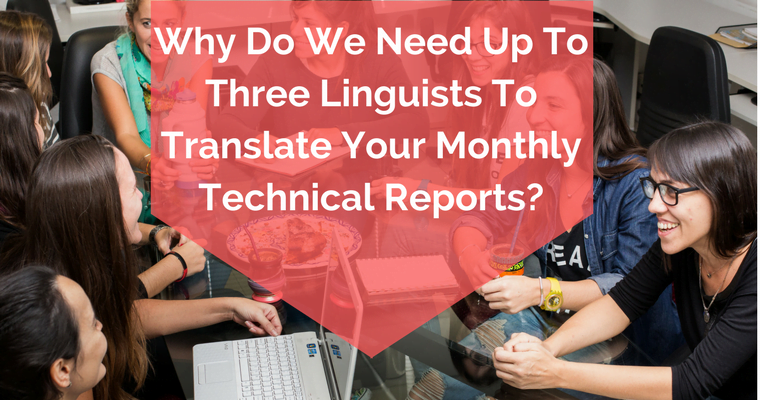 Why Do We Need Up To Three Linguists To Translate Your Monthly Technical Reports? Every time Claudia receives a report translated by her agency, she takes three steps—it’s almost a routine. First, she reads the document on the screen of her computer. Second, she uploads it to a central server, to share with her team. Third, she sends it to the CEO for a final revision. These three steps ensure that a very special goal is met, so their order is never changed. Together, they ensure safety and quality. These steps are the reason that often three linguists are necessary for translating reports and other pieces. In conclusion, they ensure that the work has been taken seriously and that several professionals have taken the time and effort to carry out specific tasks, ensuring optimal results. What goes on in each of these steps? This may be the simplest step to explain since it is translation in the strictest sense of the word. What isn’t easy is the work that the professional carries out—her challenge it to “erase” the transition from one language to the other, so that the footprints are not discernible in the final text, which must appear as if it were originally written in that language. 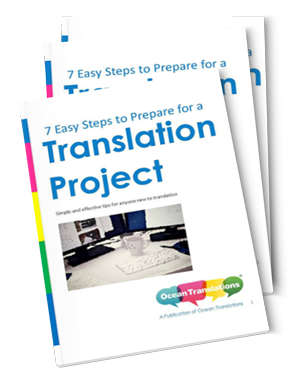 In addition to using her own knowledge, the translator also uses glossaries and resources provided by the client, which will build over time. As we already explained in a previous article, professionals also use translation memories (which help speed up the translation process), along with other systems. After step one is complete, the editor steps up to the plate. What’s his job? He conducts a detailed revision of the translated text and compares it with the original, known as the “source,” or untranslated, document. He scans the words and phrases, checks the documents against each other, looks for mistakes, opportunities for small improvement and information that could be added, always working toward the general improvement of the text. This stage takes time since the editor is fighting a battle on two fronts: he must constantly shuttle between the new, translated text, and the piece sent by the client. This requires exhaustive analysis and plenty of patience. At this stage, the third linguist forgets about the source text and works directly with the translated, edited text. Her mission is to examine the target text for coherence. Is it understandable? Does it make sense? In addition to checking the grammar, she also ensures that everything is spelled right and takes a look at punctuation. Unless there’s a major error, she doesn’t worry about the source. Her job is to make sure that the piece is written in the proper style and that, to her unbiased eyes (unbiased, because they haven’t seen the original), it is high quality and ready to be sent to the client. All that said, sometimes a piece is quite specific and technical, and requires a forth step: additional proofreading. If the terminology used is specific to a certain field and the document is going to be used, for example, in medicine, engineering or patent-registration, an error in any of the above steps could lead to risky situations. In these cases, the translation agency will include a fourth analysis, carried out by an expert in the subject matter: a professional in the field or in that specific subject. Like the prior professional (proofreader number one), he does not look at the untranslated text. Instead, his focus is how the text would be read by colleagues in his fields—that is to say, the ultimate purpose of the text. He looks carefully at every line and expression and makes sure that every word is technically and scientifically precise. Every professional is limited to his or her designated area. Before sending the work down the line, they conduct one last inspection, for which they use a verification checklist. This list includes a series of items that must be carefully examined. – Is the content faithful to the original? – Is it free from erroneous expressions? – Has the spelling been checked? – Does the text read naturally? – In scientific and technical texts, has the vocabulary been duly checked? – Are there any untranslated words or phrases? There are other services that could be involved, too. If the text requires design, for example, a Desktop Publishing (DTP) team will take care of it. And the finished product? A piece that breaks any and all language barriers.